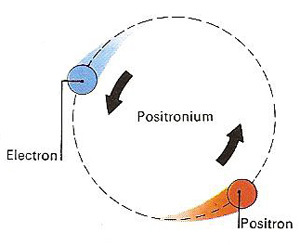 A single "atom" of positronium. Positronium is a neutral, atom-like system formed between an electron and a positron (the electron's antiparticle), held together by electromagnetic attraction. The name "positronium" was introduced by A. E. Ruark in 1945 and the system was first observed in 1951. In positronium, the electron and positron effectively orbit around each (like the stars in a binary star system). Positronium is unstable, the electron and positron annihilate forming two photons each with an energy of 511 keV (the rest mass of the electron). In ortho positronium, which has a mean life of 1.39 × 10-7 second, the spins of the positron and electron are parallel, in a triplet state. In para positronium, which has a mean life of 1.25 × 10-10 second, the spins are antiparallel, in a singlet state.